PPS is a crystalline polymer obtained by reacting paradichlorobenzene and sodium sulfide in a polar organic solvent. 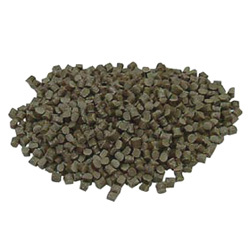 Conventional PPS resins are so- called thermally cross- linked. 1. Mechanical strength is exceedingly high, with flexural strength in particular exhibiting a high value, Excellent elastic recovery is also possessed. 2. Possesses high toughness, while high values are also exhibited for compression and shear Characteristics. 3. Possesses superior creep characteristics even under high temperatures and loads. In addition, Possesses superior fatigue resistance to repetitive stresses. 4. Elongation and impact strength are high, and brittleness, a major drawback of traditional PPS, has been improved significantly. 5. Can withstand immersion in 260 °C solder bath for 10 s, making the resin more than able to cope with electronic component surface mount technologies. 6. Lonic impurities are low, and application is possible in applications where strict electrical properties are demanded. 7. Little change in volume resistivity is shown over time, and there is almost no change in dielectric constant due to frequency or temperature. These characteristics make it an excellent insulative material. 8. Weld strength is high, and superior secondary processability (screws, insertion, etc.) is exhibited.